How can you tell what kind of program it is? National Mentoring Month is starting in a few days and there will be many ads and public service announcements showing how mentors have been an important part of someone's life. Hopefully this will motivate many people to go to the internet and search for programs where they can volunteer time, talent and hopefully dollars. 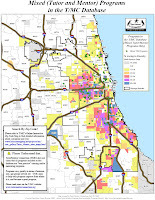 One place they can look is the Chicago Tutor/Mentor Program Locator, which has an interactive, searchable map that enables people to zoom into different sections of the Chicago area to learn what non profits, if any, offer tutoring/mentoring. Another feature is a library of links to more than 200 web sites of youth serving programs, organized by sections of the city and suburbs. But, how does someone tell the difference between one organization, and another? a) does the organization have a web site, blog, or other written material that outlines the vision, mission and strategy of the organization? 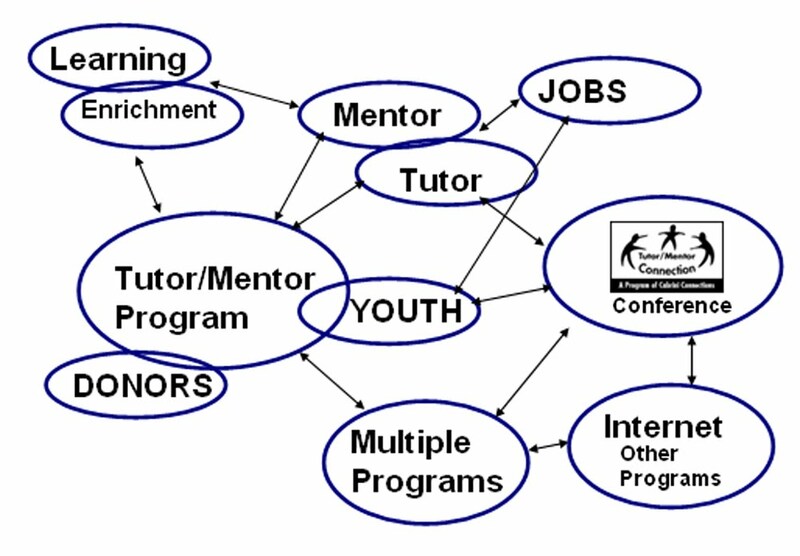 b) does the web site include a "theory of change" showing how volunteers in that tutoring and/or mentoring program help youth; and how the overall activities of the organization help youth and volunteers meet regularly, stay connected, and build long-term (more than one year) relationships? c) does the web site of organization show a "learning strategy" meaning, it points its volunteers, students and donors to other tutor/mentor programs, and resources, that can be used to benchmark, and compare, or to find help that is not available at that specific program location? d) does the web site include a history of performance, including some statistics showing how many youth and adults have participated on a regular basis each year, and for multiple years. Such a history would show how long the organization has offered tutoring and/or mentoring, and how many years the organization has been continuously connected to youth in the same neighborhood of Chicago, or any other city. e) If the organization makes claims of "graduation and college attendance rates" do they base this on the number of youth who started with the program, and who are still participating when they graduated? Or do they fudge the numbers as the Kauffman Scholars were accused of doing in the Dec/Jan 2010 issue of Youth Today? By fudging, I mean they do not include kids who dropped out of the program in early years when they report graduation or college attendance rates. g) how does this organization work with others in its zip code, city or state to share ideas, build capacity, and assure that more kids have access to great programs, not just the kids in that program? h) does the organization post financial reports, such as audits or 990 reports, on its web site? While the Tutor/Mentor Connection maintains a directory of Chicago area volunteer-based tutoring and/or mentoring programs, and a links library, we don't have the manpower to be doing an ongoing review of each program to determine which meet these criteria. Our goal is to educate consumers (volunteers, parents, donors, program leaders, etc.) so they can compare one program to another, with a goal that all programs are constantly trying to be the best at what they do. This is because each program serves different kids in a different part of the city. They all need to be as good as they can be. Many organizations will not demonstrate everything I've listed. There may be other criteria that some people might want to add to this list. My point is, no program can reach this level of excellence, and stay there, without continuous investment of time, talent and flexible operating dollars, from people and partners, who get involved, and stay involved, for many years. If you are looking to get involved, think beyond being a tutor or mentor. Inventory your talent, resources and networks, and look for ways that you can help one or more tutoring/mentoring programs on our Chicago Programs list, or in your own community, become the best at what they do, and the model everyone else is trying to duplicate. We created a forum on our Ning Site where you can post reviews of programs, and discuss what it takes to help a program move from being good, to being great. Obama supports Promise Zone. How in Chicago? Today's Chicago Tribune features a story about the Harlem Children's Zone, which is a highly visible effort to provide a wide range of educational and community support services for people in an 97 block stretch of the Harlem Area of NYC. 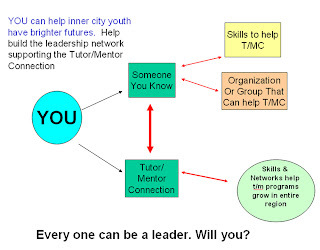 The Tutor/Mentor Connection has been proposing geographic based strategies for many years, and uses maps to help draw investment (talent and dollars) to all of the tutor/mentor programs operating in different parts of the city. 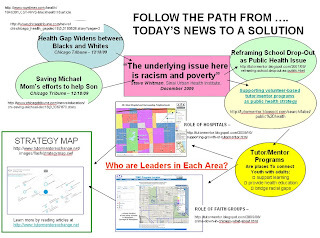 We've also been creating an information based library, so that leaders in Chicago can build their own understanding of strategies that they read about in the media. This link points to a section of the T/MC discussion forums (inactive since 2013) where you can find more information about the Harlem's Children's Zone, as well as challenges that face anyone who wants to duplicate that in Chicago or elsewhere. According to the Tribune article, "The Harlem Children's Zone offers educational, medical and social services from cradle to college." On the HCZ web site you'll see different sections describing services for pre school, elementary school, middle school, high school and college. This has been so well publicized that at this page you'll see efforts to spread the model all over the country. What I don't see on the web site are maps, that show the Harlem Zone, or show how HCZ is interacting with other community agencies that also work in the area? Do they compete with HCZ? does the HCZ use all of its media attention to draw volunteers and needed resources to programs on every block in the zone. 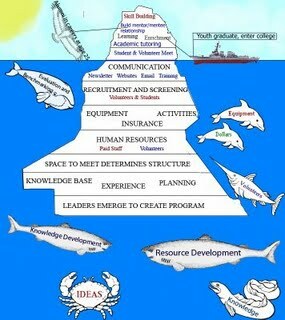 The graphic below illustrates what such a leadership role might look like. Kids and families living in high poverty area need a wide range of supports. If you think of building a new building, the architectural drawings show diagrams of how many people work together at each stage of the project, so that the end result is a completed building. Every worker at each stage needs to do their job correctly, and each needs to be fairly paid. This concept map illustrates a first grade, to first job pipeline showing how extra adult tutors/mentors, donors, leaders, etc. need to be involved in providing age-appropriate supports as kids grow up. Unless someone is creating a map, showing the organizations already operating in a neighborhood, and segmenting this by type of activity, it would be difficult to know if all of the talent and services needed were available in a neighborhood. It would also be difficult to mobilize the continuous resources to make sure everyone was getting paid to do what needs to be done. 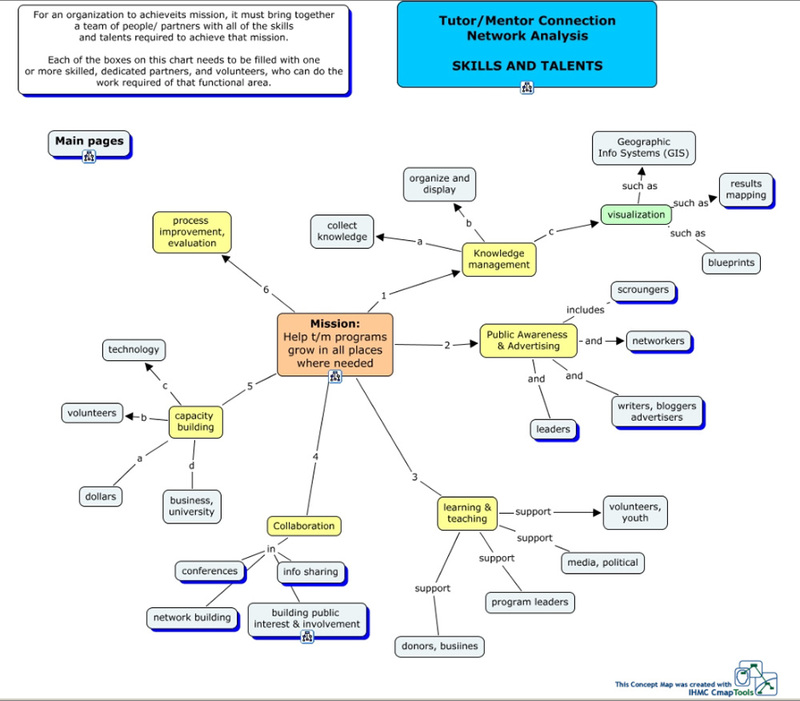 The Tutor/Mentor Interactive map is a sample of what is possible. We only map tutor/mentor programs because that is the focus of our work. We don't do this as well as we'd like because we can't find donors to invest consistently in this work. Yet, you can turn layers of information on, and of, or zoom into specific areas, to learn what programs, if any, are in any specific area. 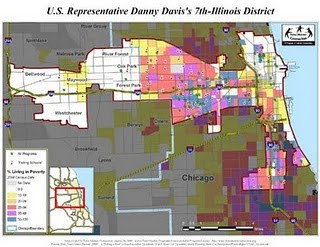 If you've been reading about Promise Zones, or inner city violence, or the state of Chicago Schools, and you are concerned about how the next $30 million or so of public money will be spent, I encourage you to take a look at our maps, and some of the articles we're pointing to. There are many strategies that leaders can take right now to make poor neighborhoods "neighborhoods of promise". There are many strategies that might cost millions, that may never come close to that goal. Did St.Paul Have a Map of the Road to Damascus? Throughout the world Christians, Jews, and people of other faiths are celebrating the year end holidays. Many people will be spending time reflecting the meaning of these holidays, and the depth of their faith. I hope that some will read this article and add it to their thinking. I used the story of St. Paul on the Road to Damascus in my title because, most people who travel, use maps to find their way. I use maps too. 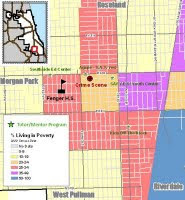 Shown is a map of the Chicago region, with areas of poverty highlighted, and with locations of Catholic Churches shown. Mike Trakan makes these maps for the Tutor/Mentor Connection. This week he posted three blog articles that show how faith groups might use these maps to build strategic involvement in many places, and for many years, so that the lives of inner city kids living in poverty are transformed, just as the lives of people of faith have been transformed by their beliefs. These articles are not intended to suggest that people in faith communities are not already very generous in the way they help the poor. Our goal is that leaders use maps to build an understanding of where they are having an impact on tutoring/mentoring programs, and where there are programs that need faith partners to help them. Our aim is that there are numerous partnership supporting each of the tutor/mentor programs already operating in the Chicago region, or helping new programs form in areas with poverty, but without programs currently operating. Without mapping where you are involved, it's easy to look at what you are doing and think that this is enough. Until we reach every poverty neighborhood, with well supported, ongoing programs, we are not doing enough to assure that more of these kids are staying in school and will be prepared for 21st century jobs and careers by the time they are adults. If you would like help in mapping the current outreach of your faith community, contact the T/MC and we may be able to help you use maps for your planning and evaluation. I hope that people in faith communities will use these maps throughout the year, not just during these periods of special celebration. I encourage you to read this article, titled 'Selfish' Giving: Does It Count If You Get In Return?. It's from a NPR report. Then read this article about Ayn Rand's Virtue of Selfishness philosophy. Then read the articles on this blog about poverty, workforce development and leadership (see tags at left). Unless donors have tremendous altruism, or tremendous motivations, or both, programs like Cabrini Connections will never have the sustained flow of resources needed to help teens joining us in 7th grade be starting jobs and careers by their mid-twenties. Can you support Cabrini Connections, Tutor/Mentor Connection with a Holiday Donation? Can you make a bequest, or support us with a corporate or foundation grant program? Do we fit with your own personal and strategic goals? I've written more than 500 article in the past few years, all aimed at one goal of "connecting people who can help, with places, programs and youth, where help will be needed for many years. I point to articles written by people who are smarter than I am, and who write better than I do. If you read these articles and apply what you are reading to the articles and ideas I'm sharing, you'll see how powerful the ideas we share can be in helping solve some of the complex social issues facing our country. Here are two articles that I hope will stimulate your thinking. In the article written by Valdis Krebs, he says "Why not use the power of the network itself to create a solution? Improve the organizational network and then use technology to help people communicate across wide spans of the human network." 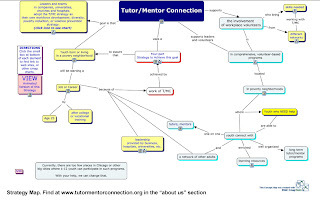 The Tutor/Mentor Connection has been connecting people and organizations for more than 16 years, and providing a library of information for people to share the same resources, ideas and their own ideas. We have create maps that anyone can use in their collective work, or their individual efforts, to help build and sustain mentor-rich organizations that constantly learn from the work each other is doing, and constantly expand their impact on the lives of inner city kids. At Cabrini Connections, we apply this network-building concept directly to our own efforts to help a small group of young people move from 7th grade, through high school, and into college, then jobs and careers. This is a long-term process, which will only be successful as we expand the network of adults who are involved, and committed to this same goal. Our aim is that when you look at our maps of Chicago, every program that is operating will be using some of these ideas to build their own systems of long-term support for the kids they are working with. When you look at asset maps, showing businesses, faith groups, colleges and hospitals, you'll see a growing number of groups who are providing the resources needed by each of these programs, and Cabrini Connections, to do this work. This can happen if these organizations and resource providers are applying the ideas we're sharing on this blog. 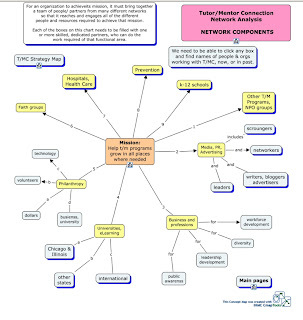 As you read about networks on this blog, and about knowledge management, innovation, and problem solving, we hope you will include the T/MC in your network, and that you'll also help us find investors and benefactors to stimulate our own role as an intermediary and catalyst for this network building process. "The underlying issue here is racism and poverty"
The front page story in the 12/18 Chicago SunTimes was Health gap kills 3,200 black Chicagoans every year. In the Chicago Tribune the front page story was Saving Michael: Mom’s efforts to help Son. The report on health disparities was on an inside page of the Tribune, with the title Health Gap Widens between Blacks and Whites. This "media map" shows how people who our outraged or emotionally connected to these stories can look at research, or competitive intelligence, that the Tutor/Mentor Connection has collected, then build neighborhood, business, or faith based strategies, that become long-term solutions to these programs. I've been writing about these issues for 16 years. However, we’re just a small voice, like a Prophet, that very few people are taking time to listen to. I've encouraged others on the Cabrini Connections, Tutor/Mentor Connection team to do the same. This video shows the interaction on Wednesday, Dec. 16, 2009 between teens living in inner city Chicago and volunteers who work in various industries and who live in neighborhoods beyond the inner city. Here's an album with two other videos showing our work. This would not be happening if Cabrini Connections did not exist, and if donors and volunteers had not been willing to put time and dollars into this organization every year since 1993. I'm one of the founders of Cabrini Connections, and the Tutor/Mentor Connection. I've been the leader since 1992. As this photo shows, I'll do almost anything to find the resources it takes to keep kids and volunteers connected to each other. This has been a tough year. Hell, it's been a tough decade. And it wasn't much easier in the 1990s. 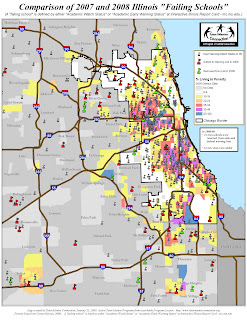 When you look at the maps of Chicago that Mike Trakan makes, how many neighborhoods have places where kids and volunteers have been connecting for the past 16 years? How many have managed to keep connected to many of these youth, and adults, so they are now able to help each other with adult lives and challenges? Read the mission statement of the Tutor/Mentor Connection. What other organization in the Chicago region has as complete a strategy intended to help every poverty neighborhood have high-quality, mentor-rich programs? Look at the conference maps to see how programs throughout the region are connecting with each other because we spend time, and money, to organize these events. We need your year-end donations and support in 2010 to continue this work, and to expand our impact. Chicago is too big a city for us to have an impact when we are struggling each month just to pay our rent. Give me a call at 312-492-9614 if you'd like to talk about more ways to help, or that we can help you. White House Mentoring. What's the Strategy? I'm part of a Youth Mentoring Listserv hosted by Dr. David DuBois. Today someone shared an article about Michelle Obama launching a White House Mentoring program. The consensus of the group was "good" and "why didn't she draw upon the collective wisdom of some of these experts to design the program?" While the White House is launching its own mentoring strategy, we have plenty of problems in Chicago. 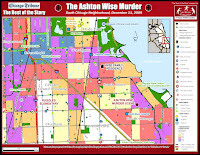 Mike Trakan, Map Maker for the Tutor/Mentor Connection, created this map, and this article, showing the location of the most recent high-profile youth murder in Chicago. Mike and the Tutor/Mentor Connection provide a lot of information and resources that leaders in Chicago, and the White House, could be using to build their own mentoring strategies. I updated a couple of the Essays in the Tutor/Mentor Institute today to help with such research. In Defining Terms and Building a Network of Purpose, I ask people to build programs based on what youth they want to help, and what result they want to achieve. 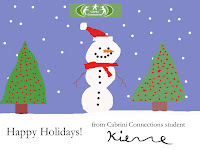 At Cabrini Connections we're celebrating the holidays this week. We've been doing this every year since 1993. Our roots extend back to 1965 when employees of the Montgomery Ward Corporation started meeting every Tuesday evening after work with elementary school kids in the Cabrini Green area. I think this represents one of the longest running tutor/mentor programs in the country. We have a lot of experience. Maybe the White House would want to talk to us? I hope you'll value this knowledge and what we've been doing enough to make a Holiday Donation so we're able to keep doing this work, and sharing our ideas, in 2010. This is an important week for Cabrini Connections, Tutor/Mentor Connection. We sent out 4000 appeals for donations last week, and are reaching out to more people through our internet networking. Without year end donations from a lot of individuals and a few corporate and foundation donors, we won't have the money to operate in 2010. Every day I'll be looking at our Holiday Fund and in our mail box, for checks ranging from $25 to $5,000 or more. This is our biggest, and most important fund raising period of the year. The money has to carry us through the first quarter of 2010. This Local Global graphic illustrates the bigger picture, which I describe as "searching for Mr. Right". 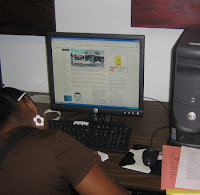 While I'm searching for donors to help us fund our Cabrini Connections program, which serves 80 teens living in the Cabrini Green area, and a network of more than 450 alumni which we're reconnecting to on the internet, the Tutor/Mentor Connection seeks to create a system of support that would make several hundred programs like this available to youth in high poverty neighborhoods. To do that we need a few benefactors who will provide up to $1 million a year in funding for the marketing, team building, training, and work we need to do to help make this happen. We've been operating on less than $225,00 a year since 1998. That does not have a big impact in a city as large as Chicago. Thus, if you're reading this, and want to help more of the 200,000 kids living in poverty have access to well organized, mentor-rich, long-term programs like Cabrini Connections, help us find Mr. Right, and help us with a few donations to keep the tutoring/mentoring at Cabrini Connections ongoing in 2010. Connections to world of work and civic life. I encourage you to visit Bob Pearlman's web site and read some of the articles. In this one, a quote that stands out is that "a social network is a student’s human connections to the real world of work and civic life." This is what a program like Cabrini Connections offers. We connect kids who live in high-poverty inner city neighborhoods with people who can model a wide range of jobs and careers. We try to keep these kids and volunteers connected for many years, to expand their aspirations of what they can be, and to help them put these goals into the work needed to achieve those goals. What the Tutor/Mentor Connection does is try to help such programs be available to youth in all of the high poverty neighborhoods of the Chicago region. In some cities and states mentoring partnerships, with annual budgets of $350,000 to $1 million are trying to support mentoring programs. We have never had more than $225,000 in a single year, and we started in 1993 with no money and just an idea of what we were trying to create. If you want to help us build this connection, why not make an endowment to the Tutor/Mentor Connection instead of building another building at your alma mater or at the local Hospital? You don't need to be in Chicago, or the US, to offer this help. This Chicago Tribune article talks about virtual volunteering. You can be anywhere to help us, and you can be anywhere to draw ideas from what we do to help kids in your own community. If you can make a donation to a Holiday Fund, you're helping us help these kids. In my last blog I pointed to the future of philanthropy, if we create it. Right after that I received an email from a local organization that I had worked with to help them submit a proposal for the government Stimulus Funding for Mentoring Programs. In the rejection letter they were told that they had a good proposal, but only 23 out of over 1400 proposals were funded. Think of this. I spent a little time investigating doing a proposal for this grant. It cost me $600 for the time a grant writer spend investigating this. She would have charged me $1600 for the full proposal. If each agency who submitted a proposal spent just $1600, then the total fund raising cost was over $2.4 million dollars. I'm sure the time and labor of many of the organizations who submitted these proposals was much more than $1600. What a waste! We need to find a more effective system of drawing dollars to doers. Who wants to help? 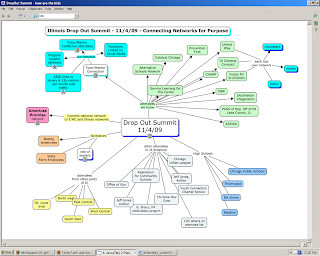 One way is to use map/databases like the Chicago Program Locator. Anyone can search by zip code, to find contact information, and web sites, for more than 160 organizations offering volunteer based tutoring and/or mentoring in the Chicago area. Using this information, you can choose who to fund, and how much to give. If we can find ways to increase the volume of potential donors who search the maps, we can push dollars to doers, without them spending the time, money, and emotional energy, that goes into writing these un-funded grant proposals. If we can apply the ideas in the Disrupting Philanthropy 2.0 article, we can do this even more effectively. I encourage you to read this article titled Disrupting Philanthropy 2.0. It's about 55 pages, so budget time to read it. This offers a broad review of how philanthropy and the organizations supported by it, will change in the coming years. The Tutor/Mentor Connection is already involved in some of this work, more as an inventor tinkering with ideas, than a social innovator with a working model to fund our innovations. However, when you ready about FasterCures, how much different is its work than what the Tutor/Mentor Connection is trying to do? While it's important that the leaders of Cabrini Connections, Tutor/Mentor Connection be reviewing this information, it's also to our best interest that leaders in industry, philanthropy, other non profits, colleges and so on, also be looking at this so we can team up to build better solutions, using our combined imagination and innovation. I look forward to connecting with you in this innovative digital future. Jill Zimmerman, a Vice President with The Alford Group, was a featured speaker at the November Tutor/Mentor Leadership and Networking Conference. She talked about The State of Funding for Tutoring and Mentoring Programs and Non-Profits. The presentation is now available on-line. Mike Trakan created this map to show organizations that attended the conference, and what neighborhoods of the Chicago region they were from. The Attendee List on the conference web site enables you to contact these organizations. The Program Locator enables you to visit their web sites (if they have one). We can change the fund raising picture for every one of the non profits who attended the conference if we can increase the number of people who reach out to provide big and small donations during the month of December, and in 2010. If you want the same goals we want, which are expressed in this "Ready by 21" web site, and in the T/MC mission statement, then I encourage you to reach out and encourage people you know to become the donors and benefactors these programs need. One way we expand the manpower at Cabrini Connections, Tutor/Mentor Connection is through volunteers. Another is through internships. Here are some places where you can learn how interns are helping us. Bradley Troast, NU Public Interest Program Fellow. See story on NU web site. Read his blog. Jordan Merlo, Loyola University Chicago intern. Follow her blog. Joe Piaskowy, a graduate student at Northwestern, and former Cabrini Connections video club volunteer, created this story about the Cabrini Connections art club for a class project. Learn about other interns from IIT, University of Michigan, Hong Kong Baptist and more. While these articles show how interns from various universities work directly from our office in Chicago, this DePaul University blog illustrates how students can support the goals of the Tutor/Mentor Connection as part of a class project. We'd like to see this duplicated in many places. While these volunteer provide tremendous talent, we still need to find donations to pay the rent and other expenses of operating, so we can provide this service opportunity. Can you help with a holiday donation? Business and Schools - Who's Right? Here's an article by Diane Ravitch titled "Why Business Leaders Should Not Be in the Driver's Seat". You can discuss this with others on the Fireside Learning forum. Make a difference. Use your vote. Enlist others. If we get enough votes on Facebook we can win a $25,000 grant from the Chase Foundation. While a vote for us on Facebook gives us a chance at finding the dollars we need, a donation to our Holiday Fund by you and people you know, can assure that our team has the dollars it needs. Read about how Cabrini Connections was recognized for excellence. In four weeks National Mentoring Month will celebrate the connections between young people and volunteers in many places around the country, including Cabrini Connections. While this campaign supports the involvement of volunteers, all of the research on mentoring says it works best when the youth and volunteer are well supported by professional staff, and when programs are able to keep youth and involvement connected to each other longer than a few months or a year. Here's a report evaluating mentoring strategies in the UK, which points out the lack of infrastructure and unrealistic expectations. So how do we find the money? In Minnesota, $14 million was raised in a single day to support 3,434 charities. 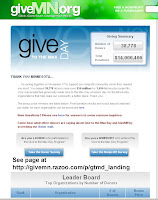 The campaign was hosted on Razoo, a fund raising portal. Right now every non-profit in the country is sending out Holiday Fund appeals, asking for donations. Some are spending huge sums of money on elaborate marketing. Others, like Cabrini Connections, are using email for most of our efforts, because we don't have much money, and because the money we do have should be spent on helping our kids and volunteers stay connected. I helped the Lawyers Lend A Hand to Youth Program at the Chicago Bar Association grow from a $2,000 award in 1994 to a foundation that awarded over $200,000 to volunteer-based tutor/mentor programs in Chicago in 2007, and 2008, because I feel that businesses, professional groups and similar intermediaries could mobilize their entire industry to support all tutor/mentor programs in the city, with a lot more long-term impact than having each of us spend precious dollars competing for a shrinking donor pool. Now, I challenge, and plead, for leaders who want to help youth stay in school, make healthy choices, and prepare for jobs and careers, to find ways to duplicate the Minnesota effort. Build campaigns in December that draw holiday dollars to volunteer-based tutor/mentor programs. Do the same in January. Use the Chicago Program Locator to find out what tutoring and/or mentoring programs are in different parts of Chicago, and which are near where you do business, worship, or attended college. Build a strategy that support all programs in a zip code, not just the one, or two, highly visible programs. If we can dramatically increase the pool of donors, Cabrini Connections, Tutor/Mentor Connection will get its share, and the money we need to help other programs grow. If we continue to compete with each other, few will have the long-term support to dramatically make a difference in the lives of more than a few inner city kids. In fact, do this every month of the year, so we have the resources to keep our kids and volunteers connected to each other, every month and for many years. I've led a volunteer based tutor/mentor program since 1975. I've learned that the lives of both youth and volunteers are enriched in different ways because of involvement in these programs. I've received messages from alumni telling me how important the tutor/mentor program was in their lives. I know how hard this is. I know that there are more than 200,000 school age children in Chicago who would benefit if they could participate in a well-organized, mentor-rich program like Cabrini Connections. Thus, I created the Tutor/Mentor Connection in 1993 to help existing tutor/mentor programs in the Chicago area get the resources each one needs to constantly improve what they do. I cannot do that by myself. I did not start this by myself. Volunteers from the Montgomery Ward Cabrini-Green Tutoring Program, which I led from 1975 to 1992, helped me start Cabrini Connections and the Tutor/Mentor Connection. This timeline shows our growth since then. Many other individuals and organizations have helped grow the Tutor/Mentor Connection, with short term, and long-term efforts. For instance, Montgomery Ward provided free space from 1993 to 1999. Public Communications, Inc helped us get media attention from 1993 to 2001. More than 40 volunteers, representing different tutor/mentor programs in Chicago, have volunteered as speakers and workshop presenters at each of the 32 Leadership and Networking Conferences we've organized since May 1994. Volunteers in the legal community created a Lend A Hand Program, which now makes grants totaling more than $200,000 to different tutor/mentor programs in Chicago. Yet, we're still a small voice in a big city, constantly looking for money and talent to help us help others. Thus, I encourage you to consider some of the ideas posted in this presentation. This graphic emphasizes the role of YOU, the individual, the business leader, the faith leader, the student. You know people who have the skills, and the relationships, who could help the Tutor/Mentor Connection have greater impact, if they added their time and talent. 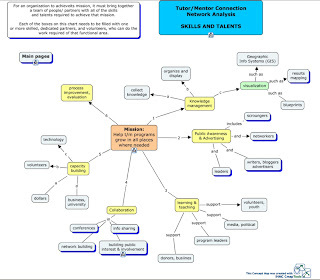 This map shows different talents/skills that are needed in any organization, including the Tutor/Mentor Connection. When we can put names of people in these boxes, knowing they share the same passion and vision as I do, we will have the small group of people that Margaret Mead wrote "can change the world". Having the right skills is a great start. Having relationships with people in philanthropy, media, business, faith groups, colleges, etc. means that we will be better able to enlist these sectors and their resources to support the growth of tutor/mentor programs, helping more kids in more places. Can you introduce people you know to the Tutor/Mentor Connection? Can you help find donors during this holiday season to fund the T/MC in 2010? If you can support our holiday fund, you can help us build this network in 2010. Chicago Schools Chief Seeks Help. Hello! We're Here. In the Business section of today's, 11/29/09, Chicago Tribune, is an article listing help Chicago Schools Chief Ron Huberman seeks to support his strategy to help about 10,000 at risk youth. (This number keeps growing. When the program was first announced it was targeting about 200 youth). If you read the article, he's calling for the same types of business involvement that I've been calling for since I started the Tutor/Mentor Connection in 1993. The only difference is that he's pointing to a new program that has not yet been created, and I'm pointing to the existing volunteer-based tutoring/mentoring programs that already exist in Chicago and who can't build the infrastructure needed to support effective tutoring/mentoring if leaders like Huberman and the Mayor don't try to draw resources to every program, every day. I'm just a small voice in Chicago. But I write these blog articles so other people, with larger voices, can read them, and integrate them into their own leadership. If you know Mr. Huberman, or if you're thinking of devoting some business resources to helping the program he is launching, I encourage you to read some of the strategy articles on this blog. I also encourage you to read some of the research, like this Critique of Youth Mentoring in the UK. If our leaders don't build an infrastructure and supply system that helps great tutor/mentor programs grow in all high poverty, high risk neighborhoods, they will spend millions of dollars and still not get the results they, and the business community, are seeking. This is another graphic created by students in the Cabrini Connections tech club. Working with volunteers they are learning uses of technology to communicate ideas. This idea makes the Turkey the boss on this holiday! I encourage all of the staff and as many volunteers as possible to write blogs about what our purpose is, and what we do each week to help kids connect with tutors/mentors and extra learning. As each person writes, they build their own understanding of the mission and goals, and their own leadership role. They also attract visitors from their own networks. Thus, you can read the blogs of our past three Northwestern University Public Interest Fellowship staffers here, here and here. You can read El DaSheon Nix's sports concepts here. You can follow the arts and writing clubs, video club and tech clob. You can read Mikes Mapping for Justice blogs. You can also meet some of our Interns from IIT, Michigan and Indiana. While not everyone will read every blog, every week, we hope a growing number of people will find one of the blogs and start reading, and that they will invite others in their own network to join in. This is a strategy for building a network of purpose. As you read this, I encourage you to start your own blog and add your own thoughts. There is one more blog I hope you'll read. It's our fund raising blog. 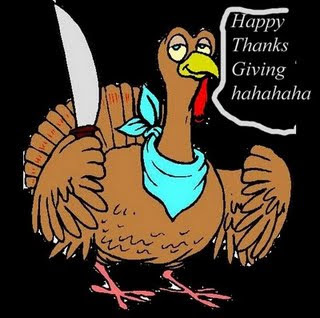 Please help us find the dollars it takes to do this work, so this Turkey won't be coming to your home. We wish you all a safe and happy holiday and thank you for letting us be part of your lives. As you reflect on your blessings I hope you'll browse some of the articles and links on this blog and start conversations with friends and family about how you and those you know can turn acts of kindness into strategies that enable kids and communities to share more of the American dream. Thank you to those who have made financial donations to help us do this work. Without your generous support we would not be able to be part of the lives of so many other people. One workshop at the Tutor/Mentor Leadership and Networking Conference was hosted by students from a first-year class at DePaul University. A group of about 30 freshmen was divided into teams, and each team researched a different section of Chicago using the Tutor/Mentor Program Locator and other resources at their disposal. As they did their research they wrote blog articles to show what they were learning. The final assignment was to draw conclusions and provide recommendations for how another group of students could continue the project. I read the blog articles and conclusions this morning. I've been posting comments and coaching the group since September 09 when the project started. The cartoon above was posted on one of the blogs. I encourage followers of the Tutor/Mentor blog to visit and read these stories yourself. They are calling on others to be involved, to help tutor/mentor programs serve inner city youth in more places. Post your own comments and feedback to the group, on their blogs, and you can add to this understanding. They are demonstrating a form of leadership that could be coming from youth groups in high schools and colleges all over the country. If you have a project like this going on right now, or in the future, please share your link with us, and come to a future conference to share your story. Here are links to two of the keynote presentations from the Tutor/Mentor Leadership and Networking Conference, held at Northwestern University last Thursday and Friday. Thrivable Networks - building networks of purpose, by Valdis Krebs and Jean Russell. How Business and Non Profits Can Work Together, by Timothy Hogan, Partner, Creative Director, The Royal Order of Experience Design. These were just two of more than 30 presentations that connected more than 145 people who want to help inner city youth have brighter futures with ideas and each other. You can see the list of speakers, and attendees, at the Conference web site. Because we keep this list published, the networking started at the conference can continue on Monday, and for the next six months and following decade. When Arne, Duncan, Secretary of Education, says "This is the time to look in our collective mirror and ask whether we like what we see or whether we can do better together." .. this is what the conference is enabling. Now it's time for those who want to help inner city kids, but cannot be directly involved as tutors/mentors, to look for other ways to help, such as making financial contributions to one of the organizations who attended the conference, or to Cabrini Connections, Tutor/Mentor Connection, who organizes this conference, and maintains a list of Chicago tutor/mentor programs so that volunteers, parents, and donors can shop and choose which program, in what neighborhood, they will support. I created this graphic when designing the program for the Tutor/Mentor Leadership and Networking Conference. It illustrates how each tutor/mentor program is drawing from a network of volunteers, donors, ideas, and peers to support the youth who participate in their own programs. Bradley Troast, our Public Interest Program Fellow from Northwestern, has posted a list of speakers on his blog. These are some of the people we are connecting to us, and each other. By writing this story on his blog, Bradly is encouraging people in his network to get involved with tutoring/mentoring. Eric Davis sent an email blast to people in his network today. I posted it here. This is another example of how one of our peers is using his own media to draw people he knows into this network. Imagine if thousands of people were doing this? Every six months since May 1994 I've hosted a leadership and networking conference. The next one starts Thursday. We already have pre-registration of close to 150 people so this is the best turnout for a November conference in almost 10 years. Take a look at the agenda and the attendee list. Maybe there are some people you'd like to meet. It's tough organizing these events without much money. We'll be providing about 50 scholarships and reduced rate entrance fees. We could not do it without people volunteering their time as speakers and workshop presenters. Thus if you'd like to help with a donation, you can send it to us at Cabrini Connections, Tutor/Mentor Connection, 800 W. Huron, Chicago, Il. 60642, or use our on-line donation form. Dan Pallotta is a leading expert on innovation in the nonprofit sector and a pioneering social entrepreneur. I encourage you to take a look at some of his ideas. Ben Wilson memorial in Trib. Sports Section. Why so little change after 25 years? After I read my Chicago Tribune today I intended to write a blog focusing on the lack of change in Chicago 25 years after the death of Ben Wilson in 1984. In previous articles I've created maps showing media stories. See one here, and here. In writing these, I go to the Tribune web site to get links. When I opened the site there was a new headline, saying "Mayhem spreads throughout city overnight after meetings to end violence"
One reason is that we compartmentalize these stories. Yet they are part of a complex problem that needs many solutions, in many places, at the same time. The people controlling the main media don't use their stories to point people to "web hubs" where they can learn about the problems, and be part of the solutions. All of this is part of building public will to solve problems. For instance, the sports section devoted a full page to the Ben Wilson story. But where are stories showing how athletes are leading tutor/mentor programs, or raising money to support one or more programs in the city? We provide examples in the articles El Da'Sheon Nix, former NU football player, is writing on his blogs. The media could find these and use the concepts in their own stories. The Tribune devoted full page coverage two two related stories today. One was the Chicago Public Schools strategy to provide paid mentoring and other support to about 300 of the most at-risk youth. Another was the CEASE Fire effort to get students at Finger to talk to each other. None of these is posting to the Tutor/Mentor Leadership and Networking Conference being held this Thursday and Friday, Nov. 19 and 20. 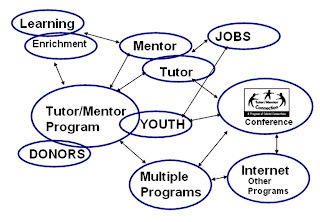 None are pointing at the Tutor/Mentor Program Locator, which enables readers to see where tutor/mentor programs are needed, and what existing programs are operating, who also need funding in order to connect youth with volunteers and safe places and learning, so they don't become new kids on the CPS list in the future. I posted an article from the Youth Mentoring Network of Australia's email newsletter on the T/MC web site this morning. It was steps programs who have lost funding, and are going out of business, should take to inform mentors and mentees. We are still having this conversation 25 years after the death of Ben Wilson because the writers of all of these articles don't focus on connecting their stories to each other and the leaders in Chicago and the US and Australia, don't focus on ways to build a consistent flow of operating dollars to help constantly improving youth serving programs be in all of the neighborhoods where kids need this help, for dozens of years, not just for one workshop to get kids talking to each other, or for one intensive intervention with kids who are already well on the way to killing each other. Part of my reading this weekend will be a review of articles written by first year students at DePaul University who are learning about the demographics of Chicago and the need for tutor/mentor programs in different areas. I wrote about this assignment here. You can read the current blog articles written by these students here. Meet students from this class Friday morning at the Tutor/Mentor Leadership and Networking Conference. I encourage you to read this article on network building. It's titled "You may find yourself... living in a large network, and you may ask yourself... well, how did I get here? Come to the Tutor/Mentor Leadership and Networking Conference next Thursday and Friday, and you can meet Valdis Krebs, Jean Russell and myself, and more than 100 other people who are involved in some way or another with helping at-risk kids stay in school and move to jobs and careers. You can view the speaker list and attendee list on the conference web site. 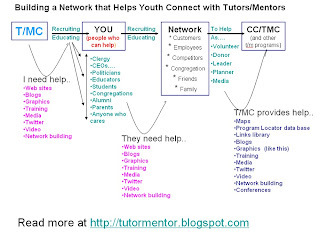 Connecting youth and volunteers in a tutor/mentor program is all about building networks. These two photos show me with Leo Hall, who was the first student I was introduced to, back in 1973. The second photo is of me with Tangela Smith Marlow, who graduated from Cabrini Connections in 1998. Both are connected to me on Facebook, along with more than 100 other former students and volunteers. We're still trying to help each other. I've led a tutor/mentor program since 1975, where my role has been to enlist people from different companies, colleges, faith networks, to be tutors/mentors so that more people would connect with more kids. I started the Tutor/Mentor Connection in 1993 to help programs like Cabrini Connections grow and operate in all parts of the Chicago region, not just at our single location near Cabrini Green. 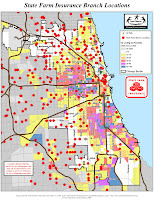 The graphic below shows how I reach out to people I know, point them to Cabrini Connections, and information that I've collected, and then to maps where they can choose what part of the Chicago area they want to help, what zip code, and then what tutor/mentor program in that area. Teaching people to use this information, or just getting more people to find it and think about it, is a huge challenge. The chart below illustrates how I reach out to other people who then can reach out to people they know. These people can use information created by the T/MC, or hosted on our sites, to choose where, why, and how to get involved. However, I need more people helping me at the front end, to get people involved, and mentor them so their involvement grows, and has a greater impact. And I need people at the back end, helping maintain data, organize conference, publish maps, raise money, and all sorts of other activities. I've been doing this work for more than 30 years and the number of people I've touched is extensive. However, I've had no simple ways to communicate these ideas. That's why I'm so excited to have Valdis Krebs and Jean Russell do a workshop at the November 19 and 20 conference. Valdis understands social network analysis, and tools to map networks, much better than I do. Valdis wrote this article to show how he, Jean and I connected as a result of work started by Pierre Omidyar, The Omidyar Network, several years ago. 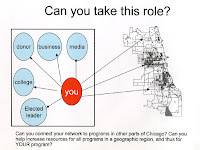 If we can apply this thinking to map the Tutor/Mentor Connection's network, and share our network, and this process, with others in Chicago, and other cities, we can teach more people to take the "network building" role that I have taken. This will result in more and better tutor/mentor programs helping more youth born in poverty move through school and into jobs, using their own networks of friends, family and mentors. 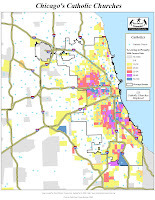 This map is one that the Tutor/Mentor Connection has created to show where poverty is most concentrated in the Chicago area, and how this contributes to poorly performing schools (see more). I encourage you to visit this PDF to see maps showing the distribution of high school drop outs in Illinois. These maps were created by the Midwest Education Laboratory of Learning Point Associates, and were distributed at the High School Drop Out Summit held on Nov. 4th, in Bloomington. The maps show where the problem is most severe. Volunteer-based Tutor/Mentor Programs are one strategy that can enlist more people who don't live in poverty, and may not have kids in school, but who need to be involved in making schools in low income areas more effective at helping kids move to college and 21st century careers. If you want to enlist your church, business, college, fraternity of civic/social group in making more volunteer-based tutoring and/or mentoring programs available in urban areas, then come to the Tutor/Mentor Leadership and Networking Conference next week at Northwestern University in Evanston. If you can't come to the conference, connect with the T/MC on Ning, or Facebook, or visit our web site and begin to use the material to support your own understanding and involvement. We're giving scholarships to more than 40 people at next week's conference. Can you make a donation to help offset that expense? Over the past few day's I've reviewed the handouts I received at the Nov. 4 Drop Out Prevention Summit in Illinois. Here are some articles about the "drop out crisis" that I've posted on this blog. You can see that this is not a new crisis to me. Most of the material I've looked at calls for a "school centered" strategy. However, the paper titled, Ensuring Workforce Skills of the Future: The Birth to Work Pipeline, talks about the disconnect between education strategies and workforce development priorities. One report Titled "Closing the Graduation Gap: Cities in Crisis" focuses on the 50 largest cities in America where the size of the school age population, and the size of the geography, makes the solutions more complex than what faces smaller communities. Here's a link to a article I wrote in January 2008 about "locating the drop out crisis". In Chicago and these other cities we need business leadership strategies that focus on other channels than public schools for connecting kids with adults who help build aspirations, and motivations, that help keep them in school, and point them at 21st century jobs and careers. These channels can be non-school tutor/mentor programs, or they can be the Internet, or both. However, without devoting a part of the funding pie to making these programs available, as "distribution centers" for business and career mentoring ideas, there won't be enough programs reaching kids in high poverty areas, and the programs won't have enough experienced, motivated leaders, able to facilitate the involvement of business volunteers, and the integration of eLearning, mentoring and tutoring at each location. 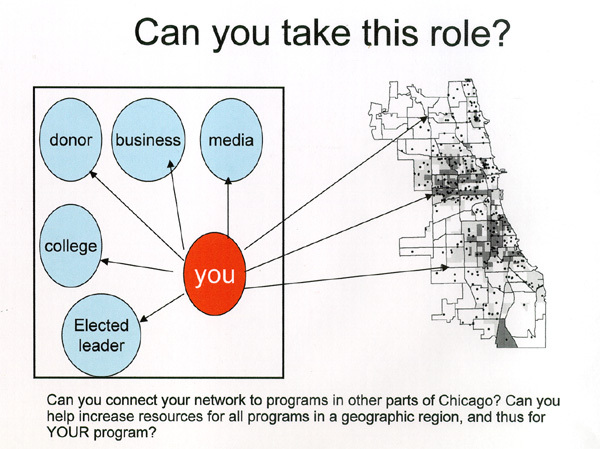 Using the Chicago Program Links and Tutor/Mentor Program Locator, business leaders can build giving strategies that support one or more programs on an ongoing basis, and assure that each program has multiple sources of volunteers, and of operating dollars. If your business, faith group, social or alumni group would like to create a strategy to support tutor/mentor programs, contact the T/MC at 312-492-9614, or attend the Tutor/Mentor Leadership and Networking Conference on Nov. 19 and 20. We'll be hosting another Tutor/Mentor Leadership and Networking Conference at Northwestern University on November 19 and 20. It's goal is to connect people involved, or interested, in volunteer-based tutoring/mentoring with each other, and with ideas they can use in their own programs, or to strategically support such programs in different places, or different cities. Nicole White of the T/MC is conference organizer, and is writing about speakers on her blob. We have links to more than 200 Chicago area youth serving programs on the T/MC web site. The goal is that leaders, volunteers and donors browse these sites to build their own opinion of best practices, and to borrow ideas that can be implemented in more places if donors provide the resources of time, talent and dollars. One of these is the Cabrini Connections program that I've led since 1993 (and before that the Cabrini Green Tutoring Program, that I led since 1975). We're trying to engage our teens and volunteers in learning, through a variety of tactics. One is that we have blogs that focus on each of our special learning activities. The blogs have become much more active this fall, and I encourage you to read them to see how kids are becoming engaged. Together these show a wide range of volunteers mentoring kids in a wide variety of learning and enrichment activities. I hope you'll visit these at least monthly and follow the growth of our students and the Cabrini Connections program. If you see ideas you'd like to adopt for your own tutor/mentor program, feel free to borrow and improve upon them. If you are blogging your own work, why not share the link with us, so we can point people to your blog, as well as the Cabrini Connections blog. One of the papers I found as a result of attending the Nov. 4 Drop Out Prevention Summit was one titled Ensuring Workforce Skills of the Future: The Birth to Work Pipeline, written by Rick Stephens, Senior Executive Vice-President of The Boeing Company and Elane V. Scott, Leadership Strategist for Developing a Capable Workforce. The call to action says "It is vital that business, media, government,health, community and education leaders come together and align their visions as never before. No one sector has the responsibility, capability or capacity to operate alone." This is what I've been writing about, and trying to achieve for the past 15 years. My voice is just a whisper in the wilderness. Hopefully some of these business leaders will read the articles on leadership and strategy that I've written, and adopt some of these ideas in their own messages, for their own self interests. They don't use graphics in this paper, but here is a T/MC graphic that I feel expresses the goal of this paper. 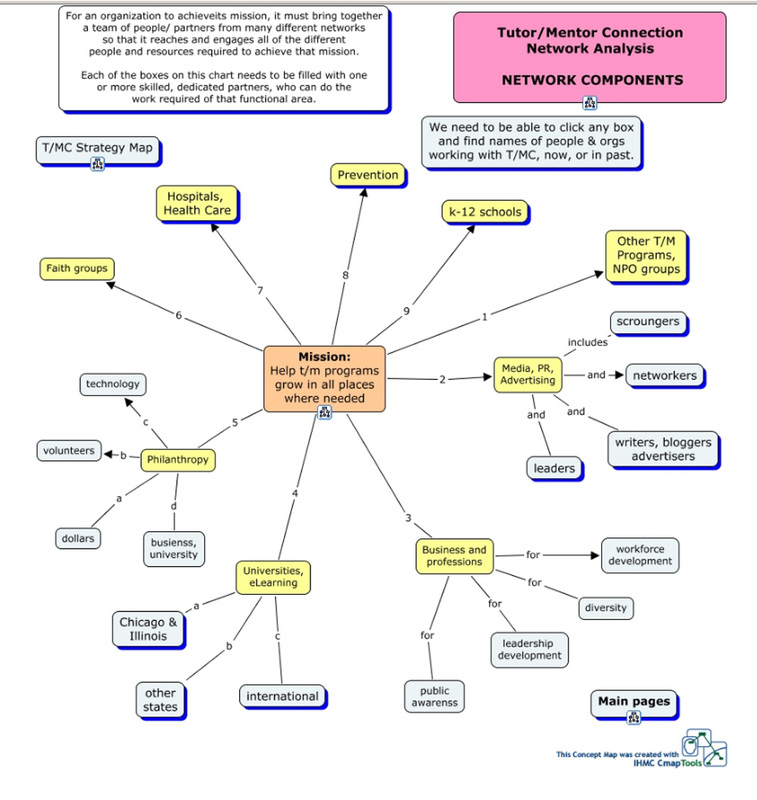 You can see the strategy map, and follow the links, on the Tutor/Mentor Connection web site. I urge readers of this blog to read the white paper, and respond to the call to action. Share this with leaders in your own business, faith group, college, alumni network. Then contact me to help you understand what you're looking at, or come to the Tutor/Mentor Leadership and Networking Conference on Nov. 19 and 20 and begin to connect your network and your ideas to the T/MC and the people in our network. Below is a map I made of people who were in a Chicago area breakout session at the Illinois Drop Out Prevention Summit who I already knew. This map also shows others in the session with me who I did not know. There's a link to an attendee list showing that more than 200 people were signed up to attend the summit from the Chicago region. There were less than 70 in the breakout room I was in, so maybe the rest were in some of the other breakout rooms. This map also shows the potential of expanding the number of people who look at th is information if we each share this information in our networks. Since my mission is to help tutor/mentor programs grow, and be in every high poverty neighborhood, this means I need the business, media, faith group and philanthropy people to use their own communications to point their networks to the Tutor/Mentor Connection library and list of more than 200 Chicago area youth serving organizations. "This is an economic issue for all of us. But most of all, I'd say it is a moral imperative." "We all must leave (this meeting) with an understanding that we all have a critical role to play to assure that all children leave school ready for careers." "Assuming that someone else will fix this problem is negligence." When Alma Powell, Chairman of the Board of America's Promise spoke she said about being a mentor, "don't start unless you plan to be there for the long term"
She ended by saying, "I know I'm preaching to the choir. You need to go out and tell the rest of the congregation what we need to do." This chart illustrates this role. However, unless America's Promise and the others who organized and participated in this conference point to the Tutor/Mentor Institute, and this essay, too few people will see this and think of ways they can connect people in their network to this information, and to places where they can use time, talent, dollars, technology, jobs and facilities, to help kids move through school safely, and then enter 21st century jobs and careers. To me this means that the adults we connect to them via tutor/mentor programs need to be advocates and resource providers who vote for them. On Wednesday, Nov. 4, I attended a High School Dropout Prevention Summit in Bloomington, Ill. I was one of several hundred people from around the state. You can see the complete list of attendees here. Ed Rust, CEO of State Farm Insurance Company, was the host of the event. Alma Powell, Chairman of America's Promise was the keynote speaker. Mr. Rust led off the meeting with statistics that showed the negative economic impact of high drop out rates, and the cost-benefit to Illinois if we could reduce this by even a small percent. You an see the statistics here. Many employees of State Farm, and of Boeing, helped facilitate the sessions of this event. It shows how volunteers can do more to support tutoring/mentoring than just being tutors/mentors. He led off the meeting saying, "we have some heavy-lifting to do" to reduce the drop out rate in Illinois, and prepare more youth for 21st century jobs and careers.I agree and look forward to working with people who attended, and who organized, this event, to make that happen. The T/MC has created maps showing where there are concentrations of high poverty, and poorly performing schools. These are areas with some of the highest drop out rates. We overlay business locations on these maps, to encourage companies to develop communications strategies that get volunteers involved from all of the places where they do business. These volunteers can support technology, be board members, help with human resources and planning, in addition to being tutors/mentors. They just need to be coached to take these roles. I hope that some of the people attending the summit will follow up on the challenges of the Drop Out Summit, and will attend the Tutor/Mentor Conference in Chicago on Nov. 19 and 20, where they can move a step forward to engagement with the different programs already in this battle and who need reinforcements to continue doing their work. You can read more about the drop out crisis in this section of the T/MC library. I'll post more articles about this DropOut summit over the next few days.